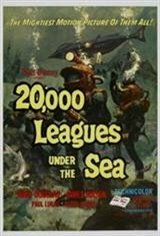 This 1954 Disney version of Jules Verne's 20,000 Leagues Under the Sea represented the studio's costliest and most elaborate American-filmed effort to date. Kirk Douglas plays a trouble-shooting 19th century seaman, trying to discover why so many whaling ships have been disappearing of late. Teaming with scientist Paul Lukas and diver Peter Lorre, Douglas sets sail to investigate--and is promptly captured by the megalomaniac Captain Nemo (James Mason), who skippers a lavish, scientifically advanced submarine. The film's special effects, including a giant squid, were impressive enough in 1954 to win an Academy Award.